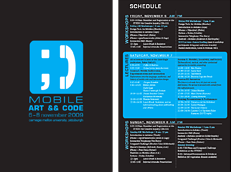 The ART && CODE symposia are made possible by a generous grant from Microsoft Research, with oversight by the Center for Computational Thinking at Carnegie Mellon University. The ART && CODE events are a project of the CMU STUDIO for Creative Inquiry, directed by Golan Levin. We express our gratitude to Microsoft Research and the CMU Center for Computational Thinking for their sponsorship, and to the STUDIO for Creative Inquiry and the CMU School of Art for their administrative support. We are grateful for additional support from Google, Inc., Hack Pittsburgh, the CMU School of Design, the CMU ETC, and the CMU HCII. We are grateful to CMU Cluster Services for their efforts in providing the best computers available for our workshops. We also express our gratitude to CMU Conference Services, for assistance in coordinating our lecture spaces and food service; and to the CMU School of Art for a variety of support, and in particular, Lauren Goshinski, Robert Kollar, Cindy Lammert, and Janice Hart of the CMU School of Art for their flexibility and assistance.